For other uses, see Axon (disambiguation). An axon (from Greek ἄξων áxōn, axis), or nerve fiber, is a long, slender projection of a nerve cell, or neuron, in vertebrates, that typically conducts electrical impulses known as action potentials away from the nerve cell body. 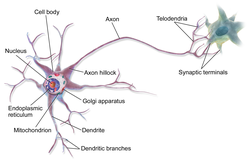 The function of the axon is to transmit information to different neurons, muscles, and glands. In certain sensory neurons (pseudounipolar neurons), such as those for touch and warmth, the axons are called afferent nerve fibers and the electrical impulse travels along these from the periphery to the cell body, and from the cell body to the spinal cord along another branch of the same axon. Axon dysfunction has caused many inherited and acquired neurological disorders which can affect both the peripheral and central neurons. Nerve fibers are classed into three types – group A nerve fibers, group B nerve fibers, and group C nerve fibers. Groups A and B are myelinated, and group C are unmyelinated. These groups include both sensory fibers and motor fibers. Another classification groups only the sensory fibers as Type I, Type II, Type III, and Type IV. 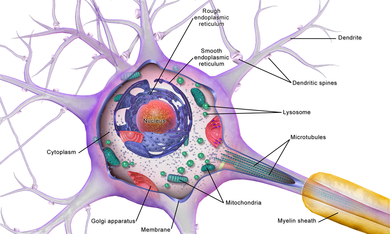 An axon is one of two types of cytoplasmic protrusions from the cell body of a neuron; the other type is a dendrite. Axons are distinguished from dendrites by several features, including shape (dendrites often taper while axons usually maintain a constant radius), length (dendrites are restricted to a small region around the cell body while axons can be much longer), and function (dendrites receive signals whereas axons transmit them). Some types of neurons have no axon and transmit signals from their dendrites. In some species, axons can emanate from dendrites and these are known as axon-carrying dendrites. No neuron ever has more than one axon; however in invertebrates such as insects or leeches the axon sometimes consists of several regions that function more or less independently of each other. Axons are covered by a membrane known as an axolemma; the cytoplasm of an axon is called axoplasm. Most axons branch, in some cases very profusely. The end branches of an axon are called telodendria. The swollen end of a telodendron is known as the axon terminal which joins the dendron or cell body of another neuron forming a synaptic connection. Axons make contact with other cells—usually other neurons but sometimes muscle or gland cells—at junctions called synapses. In some circumstances, the axon of one neuron may form a synapse with the dendrites of the same neuron, resulting in an autapse. At a synapse, the membrane of the axon closely adjoins the membrane of the target cell, and special molecular structures serve to transmit electrical or electrochemical signals across the gap. Some synaptic junctions appear along the length of an axon as it extends—these are called en passant ("in passing") synapses and can be in the hundreds or even the thousands along one axon. Other synapses appear as terminals at the ends of axonal branches. A single axon, with all its branches taken together, can innervate multiple parts of the brain and generate thousands of synaptic terminals. A bundle of axons make a nerve tract in the central nervous system, and a fascicle in the peripheral nervous system. In placental mammals the largest white matter tract in the brain is the corpus callosum, formed of some 20 million axons in the human brain. Axons are the primary transmission lines of the nervous system, and as bundles they form nerves. Some axons can extend up to one meter or more while others extend as little as one millimeter. The longest axons in the human body are those of the sciatic nerve, which run from the base of the spinal cord to the big toe of each foot. The diameter of axons is also variable. Most individual axons are microscopic in diameter (typically about one micrometer (µm) across). 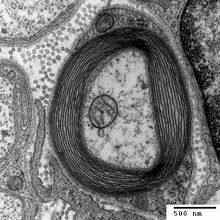 The largest mammalian axons can reach a diameter of up to 20 µm. The squid giant axon, which is specialized to conduct signals very rapidly, is close to 1 millimetre in diameter, the size of a small pencil lead. The numbers of axonal telodendria (the branching structures at the end of the axon) can also differ from one nerve fiber to the next. Axons in the central nervous system (CNS) typically show multiple telodendria, with many synaptic end points. In comparison, the cerebellar granule cell axon is characterized by a single T-shaped branch node from which two parallel fibers extend. Elaborate branching allows for the simultaneous transmission of messages to a large number of target neurons within a single region of the brain. There are two types of axons in the nervous system: myelinated and unmyelinated axons. Myelin is a layer of a fatty insulating substance, which is formed by two types of glial cells Schwann cells and oligodendrocytes. In the peripheral nervous system Schwann cells form the myelin sheath of a myelinated axon. In the central nervous system oligodendrocytes form the insulating myelin. Along myelinated nerve fibers, gaps in the myelin sheath known as nodes of Ranvier occur at evenly spaced intervals. The myelination enables an especially rapid mode of electrical impulse propagation called saltatory conduction. The myelinated axons from the cortical neurons form the bulk of the neural tissue called white matter in the brain. The myelin gives the white appearance to the tissue in contrast to the grey matter of the cerebral cortex which contains the neuronal cell bodies. A similar arrangement is seen in the cerebellum. Bundles of myelinated axons make up the nerve tracts in the CNS. Where these tracts cross the midline of the brain to connect opposite regions they are called commissures. The largest of these is the corpus callosum that connects the two cerebral hemispheres, and this has around 20 million axons. The structure of a neuron is seen to consist of two separate functional regions, or compartments – the cell body together with the dendrites as one region, and the axonal region as the other. The axonal region or compartment, includes the axon hillock, the initial segment, the rest of the axon, and the axon telodendria, and axon terminals. It also includes the myelin sheath. The Nissl bodies that produce the neuronal proteins are absent in the axonal region. Proteins needed for the growth of the axon, and the removal of waste materials, need a framework for transport. This axonal transport is provided for in the axoplasm. Detail showing microtubules at axon hillock and initial segment. The axon hillock is the area formed from the cell body of the neuron as it extends to become the axon. It precedes the initial segment. The received action potentials that are summed in the neuron are transmitted to the axon hillock for the generation of an action potential from the initial segment. The axonal initial segment (AIS) is a structurally and functionally separate microdomain of the axon. One function of the initial segment is to separate the main part of an axon from the rest of the neuron; another function is to help initiate action potentials. Both of these functions support neuron cell polarity, in which dendrites (and, in some cases, soma) of a neuron receive input signals and the neuron's axon provides output signals. The axon initial segment is unmyelinated and contains a specialized complex of proteins. It is between approximately 20 and 60 µm in length and functions as the site of action potential initiation. Both the position on the axon and the length of the AIS can change showing a degree of plasticity that can fine-tune the neuronal output. A longer AIS is associated with a greater excitability. Plasticity is also seen in the ability of the AIS to change its distribution and to maintain the activity of neural circuitry at a constant level. The AIS is highly specialized for the fast conduction of nerve impulses. This is achieved by a high concentration of voltage-gated sodium channels in the initial segment where the action potential is initiated. The ion channels are accompanied by a high number of cell adhesion molecules and scaffolding proteins that anchor them to the cytoskeleton. Interactions with ankyrin G are important as it is the major organizer in the AIS. The axoplasm is the equivalent of cytoplasm in the cell. Microtubules form in the axoplasm at the axon hillock. They are arranged along the length of the axon, in overlapping sections, and all point in the same direction – towards the axon terminals. This is noted by the positive endings of the microtubules. This overlapping arrangement provides the routes for the transport of different materials from the cell body. Studies on the axoplasm has shown the movement of numerous vesicles of all sizes to be seen along cytoskeletal filaments – the microtubules, and neurofilaments, in both directions between the axon and its terminals and the cell body. Outgoing anterograde transport from the cell body along the axon, carries mitochondria and membrane proteins needed for growth to the axon terminal. Ingoing retrograde transport carries cell waste materials from the axon terminal to the cell body. Outgoing and ingoing tracks use different sets of motor proteins. Outgoing transport is provided by kinesin, and ingoing return traffic is provided by dynein. Dynein is minus-end directed. There are many forms of kinesis and dynein motor proteins, and each is thought to carry a different cargo. The studies on transport in the axon led to the naming of kinesin. Cross section of an axon. In the nervous system, axons may be myelinated, or unmyelinated. This is the provision of an insulating layer, called a myelin sheath. In the peripheral nervous system axons are myelinated by glial cells known as Schwann cells. In the central nervous system the myelin sheath is provided by another type of glial cell, the oligodendrocyte. Schwann cells myelinate a single axon. An oligodendrocyte can myelinate up to 50 axons. Nodes of Ranvier (also known as myelin sheath gaps) are short unmyelinated segments of a myelinated axon, which are found periodically interspersed between segments of the myelin sheath. Therefore, at the point of the node of Ranvier, the axon is reduced in diameter. These nodes are areas where action potentials can be generated. In saltatory conduction, electrical currents produced at each node of Ranvier are conducted with little attenuation to the next node in line, where they remain strong enough to generate another action potential. Thus in a myelinated axon, action potentials effectively "jump" from node to node, bypassing the myelinated stretches in between, resulting in a propagation speed much faster than even the fastest unmyelinated axon can sustain. An axon can divide into many branches called telodendria (Greek–end of tree). At the end of each telodendron is an axon terminal (also called a synaptic bouton, or terminal bouton). Axon terminals contain synaptic vesicles that store the neurotransmitter for release at the synapse. This makes multiple synaptic connections with other neurons possible. Sometimes the axon of a neuron may synapse onto dendrites of the same neuron, when it is known as an autapse. Most axons carry signals in the form of action potentials, which are discrete electrochemical impulses that travel rapidly along an axon, starting at the cell body and terminating at points where the axon makes synaptic contact with target cells. The defining characteristic of an action potential is that it is "all-or-nothing" — every action potential that an axon generates has essentially the same size and shape. This all-or-nothing characteristic allows action potentials to be transmitted from one end of a long axon to the other without any reduction in size. There are, however, some types of neurons with short axons that carry graded electrochemical signals, of variable amplitude. When an action potential reaches a presynaptic terminal, it activates the synaptic transmission process. The first step is rapid opening of calcium ion channels in the membrane of the axon, allowing calcium ions to flow inward across the membrane. 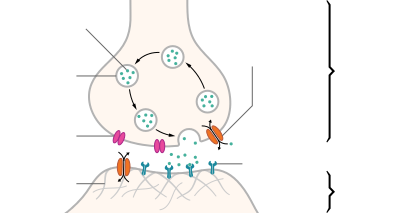 The resulting increase in intracellular calcium concentration causes synaptic vesicles (tiny containers enclosed by a lipid membrane) filled with a neurotransmitter chemical to fuse with the axon's membrane and empty their contents into the extracellular space. The neurotransmitter is released from the presynaptic nerve through exocytosis. The neurotransmitter chemical then diffuses across to receptors located on the membrane of the target cell. The neurotransmitter binds to these receptors and activates them. Depending on the type of receptors that are activated, the effect on the target cell can be to excite the target cell, inhibit it, or alter its metabolism in some way. This entire sequence of events often takes place in less than a thousandth of a second. Afterward, inside the presynaptic terminal, a new set of vesicles is moved into position next to the membrane, ready to be released when the next action potential arrives. The action potential is the final electrical step in the integration of synaptic messages at the scale of the neuron. (C) Scatter plot of signal to noise ratios for individual units againstpeak-trough time for axons, pyramidal cells (PYR) and interneurons (INT). Extracellular recordings of action potential propagation in axons has been demonstrated in freely moving animals. While extracellular somatic action potentials have been used to study cellular activity in freely moving animals such as place cells, axonal activity in both white and gray matter can also be recorded. Extracellular recordings of axon action potential propagation is distinct from somatic action potentials in three ways: 1. The signal has a shorter peak-trough duration (~150μs) than of pyramidal cells (~500μs) or interneurons (~250μs). 2. The voltage change is triphasic. 3. Activity recorded on a tetrode is seen on only one of the four recording wires. In recordings from freely moving rats, axonal signals have been isolated in white matter tracts including the alveus and the corpus callosum as well hippocampal gray matter. In fact, the generation of action potentials in vivo is sequential in nature, and these sequential spikes constitute the digital codes in the neurons. Although previous studies indicate an axonal origin of a single spike evoked by short-term pulses, physiological signals in vivo trigger the initiation of sequential spikes at the cell bodies of the neurons. In addition to propagating action potentials to axonal terminals, the axon is able to amplify the action potentials, which makes sure a secure propagation of sequential action potentials toward the axonal terminal. In terms of molecular mechanisms, voltage-gated sodium channels in the axons possess lower threshold and shorter refractory period in response to short-term pulses. The development of the axon to its target, is one of the six major stages in the overall development of the nervous system. Studies done on cultured hippocampal neurons suggest that neurons initially produce multiple neurites that are equivalent, yet only one of these neurites is destined to become the axon. It is unclear whether axon specification precedes axon elongation or vice versa, although recent evidence points to the latter. If an axon that is not fully developed is cut, the polarity can change and other neurites can potentially become the axon. This alteration of polarity only occurs when the axon is cut at least 10 μm shorter than the other neurites. After the incision is made, the longest neurite will become the future axon and all the other neurites, including the original axon, will turn into dendrites. Imposing an external force on a neurite, causing it to elongate, will make it become an axon. Nonetheless, axonal development is achieved through a complex interplay between extracellular signaling, intracellular signaling and cytoskeletal dynamics. The extracellular signals that propagate through the extracellular matrix surrounding neurons play a prominent role in axonal development. These signaling molecules include proteins, neurotrophic factors, and extracellular matrix and adhesion molecules. Netrin (also known as UNC-6) a secreted protein, functions in axon formation. When the UNC-5 netrin receptor is mutated, several neurites are irregularly projected out of neurons and finally a single axon is extended anteriorly. The neurotrophic factors – nerve growth factor (NGF), brain-derived neurotrophic factor (BDNF) and neurotrophin-3 (NTF3) are also involved in axon development and bind to Trk receptors. The ganglioside-converting enzyme plasma membrane ganglioside sialidase (PMGS), which is involved in the activation of TrkA at the tip of neutrites, is required for the elongation of axons. PMGS asymmetrically distributes to the tip of the neurite that is destined to become the future axon. During axonal development, the activity of PI3K is increased at the tip of destined axon. Disrupting the activity of PI3K inhibits axonal development. Activation of PI3K results in the production of phosphatidylinositol (3,4,5)-trisphosphate (PtdIns) which can cause significant elongation of a neurite, converting it into an axon. As such, the overexpression of phosphatases that dephosphorylate PtdIns leads into the failure of polarization. The neurite with the lowest actin filament content will become the axon. PGMS concentration and f-actin content are inversely correlated; when PGMS becomes enriched at the tip of a neurite, its f-actin content is substantially decreased. In addition, exposure to actin-depolimerizing drugs and toxin B (which inactivates Rho-signaling) causes the formation of multiple axons. Consequently, the interruption of the actin network in a growth cone will promote its neurite to become the axon. Growing axons move through their environment via the growth cone, which is at the tip of the axon. The growth cone has a broad sheet-like extension called a lamellipodium which contain protrusions called filopodia. The filopodia are the mechanism by which the entire process adheres to surfaces and explores the surrounding environment. Actin plays a major role in the mobility of this system. Environments with high levels of cell adhesion molecules (CAMs) create an ideal environment for axonal growth. This seems to provide a "sticky" surface for axons to grow along. Examples of CAM's specific to neural systems include N-CAM, TAG-1—an axonal glycoprotein——and MAG, all of which are part of the immunoglobulin superfamily. Another set of molecules called extracellular matrix-adhesion molecules also provide a sticky substrate for axons to grow along. Examples of these molecules include laminin, fibronectin, tenascin, and perlecan. Some of these are surface bound to cells and thus act as short range attractants or repellents. Others are difusible ligands and thus can have long range effects. It has also been discovered through research that if the axons of a neuron were damaged, as long as the soma (the cell body of a neuron) is not damaged, the axons would regenerate and remake the synaptic connections with neurons with the help of guidepost cells. This is also referred to as neuroregeneration. Nogo-A is a type of neurite outgrowth inhibitory component that is present in the central nervous system myelin membranes (found in an axon). It has a crucial role in restricting axonal regeneration in adult mammalian central nervous system. In recent studies, if Nogo-A is blocked and neutralized, it is possible to induce long-distance axonal regeneration which leads to enhancement of functional recovery in rats and mouse spinal cord. This has yet to be done on humans. A recent study has also found that macrophages activated through a specific inflammatory pathway activated by the Dectin-1 receptor are capable of promoting axon recovery, also however causing neurotoxicity in the neuron. The axons of neurons in the human peripheral nervous system can be classified based on their physical features and signal conduction properties. Axons were known to have different thicknesses (from 0.1 to 20 µm) and these differences were thought to relate to the speed that an action potential could travel along the axon – its conductance velocity. Erlanger and Gasser proved this hypothesis, and identified several types of nerve fiber, establishing a relationship between the diameter of an axon and its nerve conduction velocity. They published their findings in 1941 giving the first classification of axons. Axons are classified in two systems. The first one introduced by Erlanger and Gasser, grouped the fibers into three main groups using the letters A, B, and C. These groups, group A, group B, and group C include both the sensory fibers (afferents) and the motor fibres (efferents). The first group A, was subdivided into alpha, beta, gamma, and delta fibers — Aα, Aβ, Aγ, and Aδ. The motor neurons of the different motor fibers, were the lower motor neurons – alpha motor neuron, beta motor neuron, and gamma motor neuron having the Aα, Aβ, and Aγ nerve fibers respectively. Later findings by other researchers identified two groups of Aa fibers that were motor fibers. These were then introduced into a system that only included sensory fibers (though some of these were mixed nerves and were also motor fibers). This system refers to the sensory groups as Types and uses Roman numerals: Type Ia, Type Ib, Type II, Type III, and Type IV. Different sensory receptors innervate different types of nerve fibers. Proprioceptors are innervated by type Ia, Ib and II sensory fibers, mechanoreceptors by type II and III sensory fibers and nociceptors and thermoreceptors by type III and IV sensory fibers. Aβ 6-12 Yes 33–75 Secondary receptors of muscle spindle (flower-spray ending). In order of degree of severity, injury to a nerve can be described as neurapraxia, axonotmesis, or neurotmesis. Concussion is considered a mild form of diffuse axonal injury. Axonal injury can also cause central chromatolysis. The dysfunction of axons in the nervous system is one of the major causes of many inherited neurological disorders that affect both peripheral and central neurons. Demyelination of axons causes the multitude of neurological symptoms found in the disease multiple sclerosis. Dysmyelination is the abnormal formation of the myelin sheath. This is implicated in several leukodystrophies, and also in schizophrenia. A traumatic brain injury can result in widespread lesions to nerve tracts damaging the axons in a condition known as diffuse axonal injury. This can lead to a persistent vegetative state. German anatomist Otto Friedrich Karl Deiters is generally credited with the discovery of the axon by distinguishing it from the dendrites. Swiss Rüdolf Albert von Kölliker and German Robert Remak were the first to identify and characterize the axon initial segment. Kölliker named the axon in 1896. Alan Hodgkin and Andrew Huxley also employed the squid giant axon (1939) and by 1952 they had obtained a full quantitative description of the ionic basis of the action potential, leading to the formulation of the Hodgkin–Huxley model. Hodgkin and Huxley were awarded jointly the Nobel Prize for this work in 1963. The formulae detailing axonal conductance were extended to vertebrates in the Frankenhaeuser–Huxley equations. Louis-Antoine Ranvier was the first to describe the gaps or nodes found on axons and for this contribution these axonal features are now commonly referred to as the nodes of Ranvier. Santiago Ramón y Cajal, a Spanish anatomist, proposed that axons were the output components of neurons, describing their functionality. Joseph Erlanger and Herbert Gasser earlier developed the classification system for peripheral nerve fibers,[not in citation given] based on axonal conduction velocity, myelination, fiber size etc. The understanding of the biochemical basis for action potential propagation has advanced further, and includes many details about individual ion channels. In other cases as seen in rat studies an axon originates from a dendrite; such axons are said to have "dendritic origin". Some axons with dendritic origin similarly have a "proximal" initial segment that starts directly at the axon origin, while others have a "distal" initial segment, discernibly separated from the axon origin. In many species some of the neurons have axons that emanate from the dendite and not from the cell body, and these are known as axon-carrying dendrites. 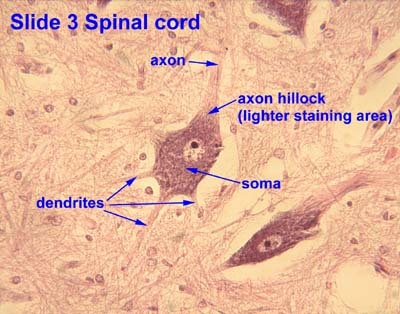 In many cases, an axon originates at an axon hillock on the soma; such axons are said to have "somatic origin". Some axons with somatic origin have a "proximal" initial segment adjacent the axon hillock, while others have a "distal" initial segment, separated from the soma by an extended axon hillock. ^ a b Triarhou, LC (2014). "Axons emanating from dendrites: phylogenetic repercussions with Cajalian hues". Frontiers in Neuroanatomy. 8: 133. doi:10.3389/fnana.2014.00133. PMC 4235383. PMID 25477788. ^ Yau, KW (1976). "Receptive fields, geometry and conduction block of sensory neurons in the CNS of the leech". J. Physiol. 263 (3): 513–538. doi:10.1113/jphysiol.1976.sp011643. PMC 1307715. PMID 1018277. ^ a b c Squire, Larry (2013). Fundamental neuroscience (4th ed.). Amsterdam: Elsevier/Academic Press. pp. 61–65. ISBN 978-0-12-385-870-2. ^ a b c Luders, E.; Thompson, P. M.; Toga, A. W. (18 August 2010). "The Development of the Corpus Callosum in the Healthy Human Brain". Journal of Neuroscience. 30 (33): 10985–10990. doi:10.1523/JNEUROSCI.5122-09.2010. PMC 3197828. PMID 20720105. ^ a b c d e Debanne, D; Campanac, E; Bialowas, A; Carlier, E; Alcaraz, G (April 2011). "Axon physiology". Physiological Reviews. 91 (2): 555–602. doi:10.1152/physrev.00048.2009. PMID 21527732. ^ Nelson, AD; Jenkins, PM (2017). "Axonal Membranes and Their Domains: Assembly and Function of the Axon Initial Segment and Node of Ranvier". Frontiers in Cellular Neuroscience. 11: 136. doi:10.3389/fncel.2017.00136. PMC 5422562. PMID 28536506. ^ Leterrier, Christophe; Clerc, Nadine; Rueda-Boroni, Fanny; Montersino, Audrey; Dargent, Bénédicte; Castets, Francis (2017). "Ankyrin G Membrane Partners Drive the Establishment and Maintenance of the Axon Initial Segment". Frontiers in Cellular Neuroscience. 11: 6. doi:10.3389/fncel.2017.00006. ISSN 1662-5102. PMC 5266712. PMID 28184187. ^ Leterrier, Christophe (28 February 2018). "The Axon Initial Segment: An Updated Viewpoint". Journal of Neuroscience. 38 (9): 2135–2145. doi:10.1523/jneurosci.1922-17.2018. PMID 29378864. ^ Rasband, Matthew N. (14 July 2010). "The axon initial segment and the maintenance of neuronal polarity". Nature Reviews Neuroscience. 11 (8): 552–562. doi:10.1038/nrn2852. ISSN 1471-003X. PMID 20631711. ^ a b c d Jones, SL; Svitkina, TM (2016). "Axon Initial Segment Cytoskeleton: Architecture, Development, and Role in Neuron Polarity". Neural Plasticity. 2016: 6808293. doi:10.1155/2016/6808293. PMC 4967436. PMID 27493806. ^ Clark, BD; Goldberg, EM; Rudy, B (December 2009). "Electrogenic tuning of the axon initial segment". The Neuroscientist : A Review Journal Bringing Neurobiology, Neurology and Psychiatry. 15 (6): 651–68. doi:10.1177/1073858409341973. PMC 2951114. PMID 20007821. ^ a b Yamada, R; Kuba, H (2016). "Structural and Functional Plasticity at the Axon Initial Segment". Frontiers in Cellular Neuroscience. 10: 250. doi:10.3389/fncel.2016.00250. PMC 5078684. PMID 27826229. ^ a b Susuki, K; Kuba, H (March 2016). "Activity-dependent regulation of excitable axonal domains". The Journal of Physiological Sciences : JPS. 66 (2): 99–104. doi:10.1007/s12576-015-0413-4. PMID 26464228. ^ a b c d e Alberts, Bruce (2004). Essential cell biology : an introduction to the molecular biology of the cell (2nd ed.). New York [u.a. ]: Garland. pp. 584–587. ISBN 978-0-8153-3481-1. ^ a b Alberts, Bruce (2002). Molecular biology of the cell (4th ed.). New York [u.a. ]: Garland. pp. 979–981. ISBN 978-0-8153-4072-0. ^ Sadler, T. (2010). Langman's medical embryology (11th ed.). Philadelphia: Lippincott William & Wilkins. p. 300. ISBN 978-0-7817-9069-7. ^ Hess, A; Young, JZ (20 November 1952). "The nodes of Ranvier". Proceedings of the Royal Society. Series B. 140 (900): 301–320. doi:10.1098/rspb.1952.0063. JSTOR 82721. PMID 13003931. ^ Robbins, A; Fox, S (November 2013). "Short Duration Waveforms Recorded Extracellularly from Freely Moving Rats are Representative of Axonal Activity". Frontiers in Neural Circuits. 7 (181): 7–11. doi:10.3389/fncir.2013.00181. PMC 3831546. PMID 24348338. ^ Chen, Na; Yu, Jiandong; Qian, Hao; Jin-Hui (2010). "Axons Amplify Somatic Incomplete Spikes into Uniform Amplitudes in Mouse Cortical Pyramidal Neurons". PLOS ONE. 5 (7): e11868. doi:10.1371/journal.pone.0011868. PMC 2912328. PMID 20686619. ^ Wolpert, Lewis (2015). Principles of development (5th ed.). pp. 520–524. ISBN 978-0-19-967814-3. ^ Fletcher, TL; Banker, GA (December 1989). "The establishment of polarity by hippocampal neurons: the relationship between the stage of a cell's development in situ and its subsequent development in culture". Developmental Biology. 136 (2): 446–54. doi:10.1016/0012-1606(89)90269-8. PMID 2583372. ^ Jiang, H; Rao, Y (May 2005). "Axon formation: fate versus growth". Nature Neuroscience. 8 (5): 544–6. doi:10.1038/nn0505-544. PMID 15856056. ^ Goslin, K; Banker, G (April 1989). "Experimental observations on the development of polarity by hippocampal neurons in culture". The Journal of Cell Biology. 108 (4): 1507–16. doi:10.1083/jcb.108.4.1507. PMC 2115496. PMID 2925793. ^ Lamoureux, P; Ruthel, G; Buxbaum, RE; Heidemann, SR (11 November 2002). "Mechanical tension can specify axonal fate in hippocampal neurons". The Journal of Cell Biology. 159 (3): 499–508. doi:10.1083/jcb.200207174. PMC 2173080. PMID 12417580. ^ a b Arimura, N; Kaibuchi, K (March 2007). "Neuronal polarity: from extracellular signals to intracellular mechanisms". Nature Reviews. Neuroscience. 8 (3): 194–205. doi:10.1038/nrn2056. PMID 17311006. ^ Serafini, T; Kennedy, TE; Galko, MJ; Mirzayan, C; Jessell, TM; Tessier-Lavigne, M (12 August 1994). "The netrins define a family of axon outgrowth-promoting proteins homologous to C. elegans UNC-6". Cell. 78 (3): 409–24. doi:10.1016/0092-8674(94)90420-0. PMID 8062384. ^ Hong, K; Hinck, L; Nishiyama, M; Poo, MM; Tessier-Lavigne, M; Stein, E (25 June 1999). "A ligand-gated association between cytoplasmic domains of UNC5 and DCC family receptors converts netrin-induced growth cone attraction to repulsion". Cell. 97 (7): 927–41. doi:10.1016/S0092-8674(00)80804-1. PMID 10399920. ^ Hedgecock, EM; Culotti, JG; Hall, DH (January 1990). "The unc-5, unc-6, and unc-40 genes guide circumferential migrations of pioneer axons and mesodermal cells on the epidermis in C. elegans". Neuron. 4 (1): 61–85. doi:10.1016/0896-6273(90)90444-K. PMID 2310575. ^ Huang, EJ; Reichardt, LF (2003). "Trk receptors: roles in neuronal signal transduction". Annual Review of Biochemistry. 72: 609–42. doi:10.1146/annurev.biochem.72.121801.161629. PMID 12676795. ^ a b Da Silva, JS; Hasegawa, T; Miyagi, T; Dotti, CG; Abad-Rodriguez, J (May 2005). "Asymmetric membrane ganglioside sialidase activity specifies axonal fate". Nature Neuroscience. 8 (5): 606–15. doi:10.1038/nn1442. PMID 15834419. ^ Bradke, F; Dotti, CG (19 March 1999). "The role of local actin instability in axon formation". Science. 283 (5409): 1931–4. doi:10.1126/science.283.5409.1931. PMID 10082468. ^ Furley, AJ; Morton, SB; Manalo, D; Karagogeos, D; Dodd, J; Jessell, TM (6 April 1990). "The axonal glycoprotein TAG-1 is an immunoglobulin superfamily member with neurite outgrowth-promoting activity". Cell. 61 (1): 157–70. doi:10.1016/0092-8674(90)90223-2. PMID 2317872. ^ Kunik, D (2011). "Laser-based single-axon transection for high-content axon injury and regeneration studies". PLoS ONE. 6 (11): e26832. doi:10.1371/journal.pone.0026832. PMC 3206876. PMID 22073205. ^ Schwab, Martin E. (2004). "Nogo and axon regeneration". Current Opinion in Neurobiology. 14 (1): 118–124. doi:10.1016/j.conb.2004.01.004. PMID 15018947. ^ Gensel; et al. (2009). "Macrophages promote axon regeneration with concurrent neurotoxicity". Journal of Neuroscience. 29 (12): 3956–3968. doi:10.1523/JNEUROSCI.3992-08.2009. PMC 2693768. PMID 19321792. ^ Andrew, B. L.; Part, N. J. (1972). "Properties of fast and slow motor units in hind limb and tail muscles of the rat". Q J Exp Physiol Cogn Med Sci. 57 (2): 213–225. PMID 4482075. ^ Russell, N. J. (1980). "Axonal conduction velocity changes following muscle tenotomy or deafferentation during development in the rat". J Physiol. 298: 347–360. doi:10.1113/jphysiol.1980.sp013085. PMC 1279120. PMID 7359413. ^ Pocock, Gillian; et al. (2004). Human Physiology (2nd ed.). New York: Oxford University Press. pp. 187–189. ISBN 978-0-19-858527-5. ^ Segun Toyin Dawodu (16 August 2017). "Traumatic Brain Injury (TBI) - Definition, Epidemiology, Pathophysiology". Medscape. Archived from the original on 12 June 2018. Retrieved 14 July 2018. ^ Krämer-Albers EM, Gehrig-Burger K, Thiele C, Trotter J, Nave KA (November 2006). "Perturbed interactions of mutant proteolipid protein/DM20 with cholesterol and lipid rafts in oligodendroglia: implications for dysmyelination in spastic paraplegia". J. Neurosci. 26 (45): 11743–52. doi:10.1523/JNEUROSCI.3581-06.2006. PMID 17093095. ^ Matalon R, Michals-Matalon K, Surendran S, Tyring SK (2006). Canavan disease: studies on the knockout mouse. Adv. Exp. Med. Biol. Advances in Experimental Medicine and Biology. 576. pp. 77–93, discussion 361–3. doi:10.1007/0-387-30172-0_6. ISBN 978-0-387-30171-6. PMID 16802706. ^ Tkachev D, Mimmack ML, Huffaker SJ, Ryan M, Bahn S (August 2007). "Further evidence for altered myelin biosynthesis and glutamatergic dysfunction in schizophrenia". Int. J. Neuropsychopharmacol. 10 (4): 557–63. doi:10.1017/S1461145706007334. PMID 17291371. ^ "Brain Injury, Traumatic". Medcyclopaedia. GE. Archived from the original on 26 May 2011. ^ Finger, Stanley (1994). Origins of neuroscience : a history of explorations into brain function. Oxford University Press. p. 47. ISBN 9780195146943. OCLC 27151391. Kölliker would give the "axon" its name in 1896. ^ Sansom B. "Reflex Isolation". Archived from the original on 15 February 2010. ^ Hellier, Jennifer L. (16 December 2014). The Brain, the Nervous System, and Their Diseases [3 volumes]. ABC-CLIO. ISBN 9781610693387. Archived from the original on 14 March 2018. ^ Ke Hsu & Susumu Terakawa (1998). "Fenestration in the myelin sheath of nerve fibers of the shrimp: A novel node of excitation for saltatory conduction". Journal of Neurobiology. 30 (3): 397–409. doi:10.1002/(SICI)1097-4695(199607)30:3<397::AID-NEU8>3.0.CO;2-#. ^ J. L. Salzer; B. Zalc (24 October 2016). "Myelination". Current Biology. 26 (20): R971–R975. doi:10.1016/j.cub.2016.07.074. PMID 27780071. ^ a b Höfflin, Felix; Jack, Alexander; Riedel, Christian; Mack-Bucher, Julia; Roos, Johannes; Corcelli, Corinna; Schultz, Christian; Wahle, Petra; Engelhardt, Maren (2017). "Heterogeneity of the Axon Initial Segment in Interneurons and Pyramidal Cells of Rodent Visual Cortex". Frontiers in Cellular Neuroscience. 11: 332. doi:10.3389/fncel.2017.00332. ISSN 1662-5102. PMC 5684645. PMID 29170630. Histology image: 3_09 at the University of Oklahoma Health Sciences Center — "Slide 3 Spinal cord"
Bialowas, Andrzej, Carlier, Edmond, Campanac, Emilie, Debanne, Dominique, Alcaraz. Axon Physiology, GisèlePHYSIOLOGICAL REVIEWS, V. 91 (2), 04/2011, p. 555-602.